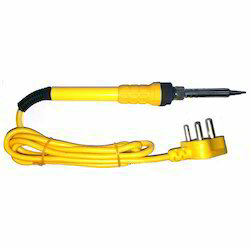 Leading Manufacturer of ceramic heater soldering iron from New Delhi. We are offering an Ceramic Heater Soldering Iron.These irons find a low usage in plastic welding and pyrography and are mainly used for installation, repairs and production work in electronic applications.This soldering iron is available in diverse dimensions and specifications. Looking for Ceramic Heater Soldering Iron ?